Pioneers in the industry, we offer animal / poultry feed plant from India. Soft Raw Pellet Wheat Bran,Shrogum,Molassis,Maizes,corn,Sallt etc..
We offer our clients precision engineered pellet plant that is fabricated from superior quality raw materials and can be custom made as per the specific requirements of our clients. Capacity Ranges from 2000 Kgs. / Per Hour to 20000Kgs / Per Hour. High accuracy and heavy duty. 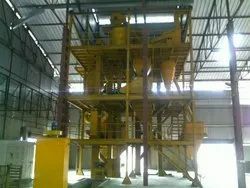 MS Fabricated body of Pellet Press, Mixture, Elevators, Cooler. Low noise / low vibration. MS fabricated Structure made from Angle, Chanel, I Beam.